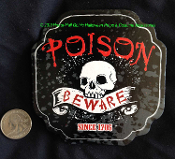 Set of 8 Drink Coasters, printed with a gothic style bloody red POISON warning, featuring a spooky gothic Skull biting a BEWARE sign in his rotting teeth - since 1705. Have drink on us and pick your POISON! You're just cleaning up after your epic party when you realize it that something is definitely different. Unlike previous events, there are no drink glass water rings or sticky drips from your counters and tables to be seen. This time, everyone used a coaster. Everyone! Maybe it's because you handed out a coaster with every glass. No. You've tried that before. You found the coolest gothic printed heavyweight cardstock paperboard coasters. You love that everyone commented on how unique they are! Colorful gruesome glossy design printed on only one side and meant for only temporary party single use. Each die-cut Coaster SET includes EIGHT (8) identical gothic themed pieces, which you can glue back to back for double-sided coasters, if desired for multiple use! Paper-Pulpboard helps protect furniture from messy water drops caused by drink condensation. Great for Halloween, cosplay costume party, Walking Dead movie night, pirate birthday, dungeon of doom, prop building supplies- anytime you need a frightfully festive touch! Perfect for poker games, social events, home decor and seasonal horror decoration. Standard sized drink coasters - heavyweight thick cardboard stock paper-pulp recyclable material.